Cartographer: Dawson, Lieut. 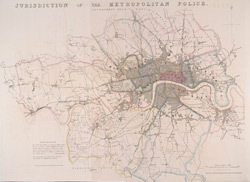 Robert K.
Map scale description: 2'' : 1 m.
This map illustrates plans for the reform of the jurisdiction of Metropolitan Police. Based on Dawson's map of 1832, the map's title appear along the top, with compass star at top right, explanatory note at bottom left, and a scale bar at bottom right. District boundaries are highlighted in colour, with the old limits of London, Westminster and Southwark shaded. Formed in 1829, the Metropolitan Police had its jurisdiction extended in 1839 to Greater London - an area taken to mean all parishes partly within twelve miles of Charing Cross or wholly within fifteen miles of Charing Cross. In the same year, the City of London formed its own police force.